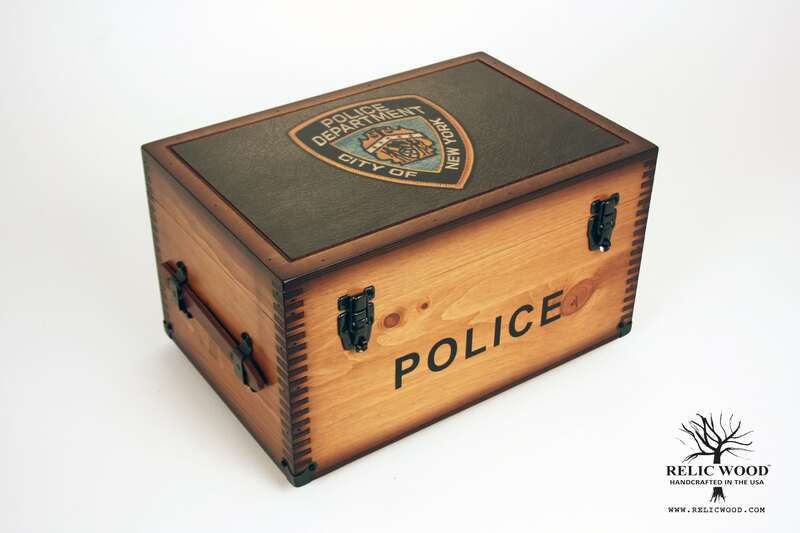 The New York Police Department Patch Keepsake box includes NYPD Police Department Patch artwork on the top, and Police text on the front. Additional Options: Nameplate, felt shadowbox, challenge coin holder, US flag holder, flag plaque, and 5X7 plaque. Adding these options to our “In Stock” Keepsake Boxes WILL NOT affect the time it takes to ship these. Great way to personalize without the wait! Add a Black Felt Shadowbox to Inside Lid? 1/4 Inch Natural Cork mounted on wood backing with black felt. Perfect for pinning medals, photos, patches, etc. Want to add a Challenge Coin Holder? Want to add a US Flag Holder? Want to add a Flag Plaque? Want to add a 5″ X 7″ Brass Plaque? Place a 5″ X 7″ brass plaque on the inside lid. Perfect for prayer, poems, quotes, & personal messages, etc. This option is only available if felt shadow box is not added. We can pin the medals to the shadowbox lid for you! This service WILL affect delivery time, plan accordingly. Please mail medals to the address on our Contact Us page. One of a kind and handmade in America. The NYPD Patch Keepsake box includes the New York Police Department Patch on the top. Personalize it with an engraved brass nameplate up to 75 characters. Features the classic font POLICE text printed on the the box front and a “faux black leather” background image on the lidtop.